Last week, I had my sister and her fiance round for tea. My twin isn’t a bad cook – she has russelled up more than a few lovely tea’s for me before, so I decided to make something I hadn’t made before – Rosted Vegetable Lasagna. Pre-heat the oven to 190°C / fan oven 170°C / Gas 5. Put the butternut squash, red onion and peppers into a large roasting tin and add the olive oil and seasoning, tossing to coat. Roast for 25-30 minutes, turning once, until the vegetables are tender. Add the cherry tomatoes, then stir in the DOLMIO red sauce for lasagne. 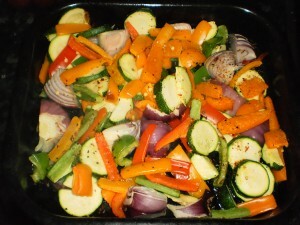 Tip half the vegetable mixture into a large rectangular baking dish, measuring about 26cm x 20cm. 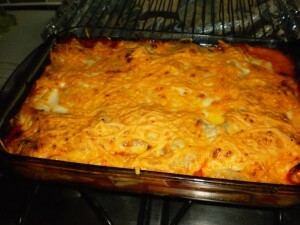 Arrange 3 lasagne sheets on top, then spread half the DOLMIO white sauce for lasagne over them. Repeat the layers, then sprinkle the grated mozzarella evenly over the surface. Simple, yet simply amazing! Happy cooking! Recipe time on the blog: http://t.co/gZA2VnE simple yet amaze!